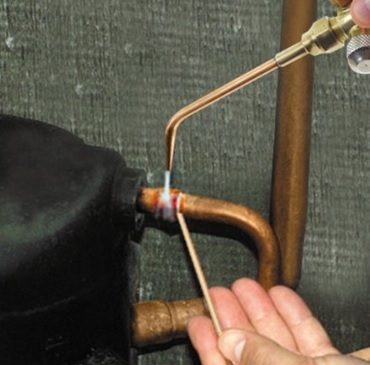 A brazing torch is required in HVAC mainly to solder line-sets or fix a refrigerant leak. As with all tools in HVAC they are not the cheapest thing to buy usually running $200-$500 dollars depending on the brand. Often a set can be bought cheaply at a swap meet although this may be a bit of a risk on the shape the set is in. With that said I have seen some good used sets at yard sells and swap meets once in a great while. One thing to keep in mind is many people new to HVAC simply drop out quickly not realizing how demanding the job can be physically. Getting an almost new set from such an individual would be the best option. Of course if you are in a hurry this will not be a choice. If you are new to HVAC than you may wonder what type of set to get. This can depend on the tech and often different types are used. For example I know an old HVAC tech that almost exclusively used Oxygen to solder. In my experience this is rare though and most used Oxy Acetylene. The difference between the brazing styles and the gas used is the heat that can be generated. The minimum temperature needed for brazing is 1100-1500 degrees Fahrenheit. Here is the heat generated by gas type. If you are new to HVAC than more than likely the school you went to taught Oxy Acetylene as it can braze up anything if used right. Of course if not used right Oxy Acetylene can burn straight though the surface being brazed. Oxy Acetylene does have the benefit of making a job go quicker when done right. Most HVAC techs will always have an opinion about what is best. The main thing to look for when buying a set is what you feel comfortable using, and what works for you to get the job done. Another thing is when buying a set is if the tanks are included or not. Some companies will supply tanks while others dont. Whether tanks need to be bought or not will be a different depending on the scenario.